We get excited for the Super Bowl around here. We don’t have a big party, & 3/4 of us could care less about football. But we do make snacks and watch the commercials – I mean, the game! The kids look forward all year to a meal composed entirely of snacks. Every year I throw in something new for us to try – last year it was Mocha Valencia Cupcakes (look for those coming up next month for Valentine’s Day! ), but we also have some old standards that I have to make to avoid an uprising. Chex Mix & sausage balls, for example. And this cheese ball dip. My sister-in-law gave me this recipe years ago, and it has been one of our favorites ever since. It makes a lot of dip, so unless you are having a big party, be prepared for leftovers. But that’s okay, because cheese & crackers is a legit lunch option, right? Don’t forget to check out what the rest of the On Our Plates ladies have cooking this month. Next up is Kathy with Super Bowl goodies! 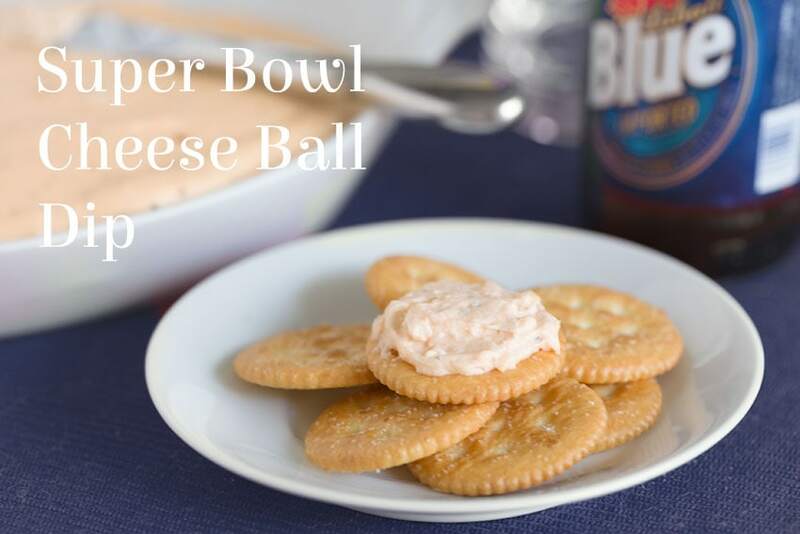 Tangy cheese ball dip that goes perfectly with Ritz crackers. This recipe makes plenty of dip for a big group. Heat cream cheese in a large pan over medium-low heat, stirring often to prevent scorching. When cream cheese is softened, add sour cream & stir until blended. Add Italian Dressing Mix & stir until blended. Add sharp cheddar & continue to stir over medium-low heat until cheddar is completely melted & mixture is smooth. Pour into serving bowl and refrigerate until cold. Serve with crackers & enjoy!